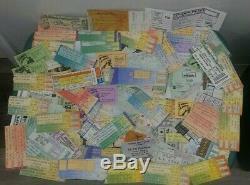 Up for your consideration is more than 110 used/unused concert tickets/stubs from the 1970's to the early 2000's. There are some duplicate tickets of the same show (must have taken the family) and duplicates of artists for different shows/different years. Please look at my photos as they are apart of my description. Allman Bros Dickey Betts, Mar 14, 1986. King Blues Festival, Aug 14, 2004 x 2. King Blues Music Fest w Kenny Wayne Shepherd, Tower of Power & Indigenous, Sept 15, 1999. King & Robert Cray, June 10, 1997 x 2. King and Robert Cray, June 10, 1997 x 2. King Blues Festival, Sept 6, 2002. King Blues Festival, Sept 9, 2005 x 2. Blood, Sweat & Tears featuring David Clayton Thomas, March 19, 1975. BOB Dylan & Tom Petty & the Hearthbreakers, July 11, 1986. Bob Seger and The Silver Bullet Band-- Sept, 16, 1978. Bob Seger, Feb 19, 1996 x 3. Bob Seger, Sept 29, 1988. BONUS: Magician David Copperfield, April 15, 2005 x 2. Bruce Hornsby /The Range, Month? Bruce Hornsby, Dec 5, 1993. Bryan Adams, Jun 11, 1987 x 2. Chicago, Jul 27, 2001 x 2. Chuck Mangione, June 21, 1983 per yellow slip. David Sanborn, Nov 21, 1999. Dickey Betts & The Gregg Allman Band, April 15, ? Dire Straits, Oct 10, 1985 x 2. Earth, Wind & Fire, Jan 22, 1988. Eric Clapton, Apr 29, 1979 x 2. Eric Clapton, Sept 10, 1988. Faye & M'Town--June 4, ? George Benson, Aug 29, 1985. Gladys Night with Sinbad, Jan 29, 2005. Harry Chapin, Nov 26, 1978. James Taylor, July 24, 1979 x 2 per yellow slip. James Taylor, Jun 26, 1991. Jimmy Buffett, Aug 15, 1995. //Borin Lane & The Chartbusters, Apr 13, 1985. Kool & the Gang -- July 27, 1983 x 2. Kool & the Gang, July 18, 1987. Lionel Richie, Oct 24, 1986 x 3. Michael Bolton, Aug 24, 1990. Molly Hatchet, Dec 12, 1981. Naughty by Nature, July 9, 1993--per yellow slip these 5 tix are Naughty by Nature. Neil Young, Feb 10, 1983. New Kids on the Block, July 28, 1990 x 4. Paul Butterfield Blues Band, March 31, ? Phil Collins & his Hot Tub Band, Jun 22, 1985. Robert Cray, Feb 17, 1989. Rod Stewart, Feb 0, 1982. Rod Stewart, Oct 14, 1977. Rufus, Billy Preston & B. Stanley Turentine & Lonnie Liston Smith--March 24, ? X 2 w/small newspaper write-up. Steve Winwood, Aug 26, 1988. Stevie Wonder, Jan 17, 1981 per yellow slip. Ted Nugent, Jun 2, 1979. The Allman Brothers Band, Aug 22, 2004 x 2. The Allman Brothers Band, Aug 24, 1999. The Allman Brothers Band, Mar 24, 2002. The Eagles, 1879 per yellow slip. The Eagles, 1978 per yellow slip. The Kinks, July 29, 1979. The Moody Blues, July 12, 1986. The Moody Blues, Nov 21, 1981. The O'Jays, April, 1, 1976. The Police/The Go Go's, Jan 23, 1982. Tina Turner with Cyndi Lauper, July 15, 1997. Tina Turner, July 27, 1985. Todd Rundgren, Apr 20, 1980. Tower Of Power, April 24, 2003. Tower of Power, Dec 28, 1994. Tower of Power, May 16, ? UNKNOWN ARTIST, CHICAGO per google, Aug 17, 1975. UNUSED Bob Seger & The Silver Bullet Band, Jan 20, 2007. UNUSED Bruce Honsby/The Range Sept 17, 1988. UNUSED James Brown, May 10, 2005 x 2 unused. War & Boogie Chilluu, July 16, 1993. The item "Lot USED/UNUSED concert tickets stubs Clapton B B King The Police Seger Utopia+" is in sale since Thursday, April 11, 2019. This item is in the category "Entertainment Memorabilia\Music Memorabilia\Other Music Memorabilia". The seller is "vinnicks-dream" and is located in North Port, Florida. This item can be shipped to United States.